Resources available for conservation are limited; there is only so much money available and a limit to the amount of effort that can be spent. Recent debates have highlighted the need to look further than the usual flagship animal species that form the basis of most conservation campaigns. Pandas may be cuter than toads but every animal has a role to play, from the lowly ant to the mighty elephant. It is clear that balance is essential however, elephants and similar species are not only important because they easily garner public support. Powerful interactions exist within ecosystems due to the complex ecosystem services provided by the larger animals and the resulting interactions with smaller animals. It has been suggested that changes in large animal densities, mainly due to man, will result in a cascade of negative consequences and will have a huge impact on the dynamics of both plant and animal communities. Unfortunately, it is well-known that many large animal populations are declining in abundance in their native range. Let's take a look at elephants. 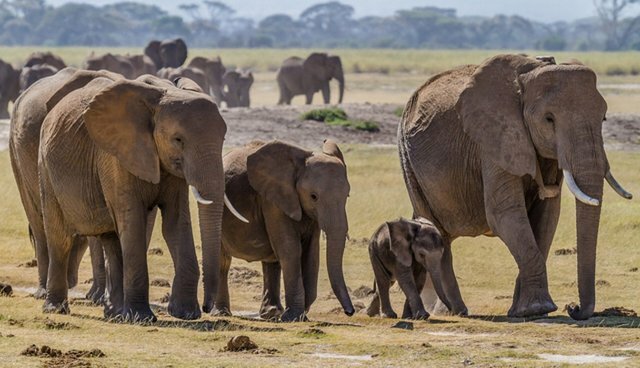 Elephants are well known for their destructive foraging behavior, which is the main cause of the human-elephant conflict in Asia and Africa, but this behavior surprisingly provides a plethora of services to animals of a more modest size within the ecosystem. Elephant feet create indents in the ground which may fill up with water brought to the surface from underground. These small puddles open up drinking opportunities for small animals like frogs and rodents who uses the elephants' weight as a service to themselves (although many of their friends may have been flattened in the process). Next, as elephants strip trees of all their nutritious growths, leaving them either damaged or dead, and even bulldoze some with their hefty maneuvering in search of food, the resulting damaged or dead trees may provide nests for certain tree dwelling animals; a study showed that arboreal lizards in Kenya are positively affected by an increase in elephant-damaged trees in an area as they make use of the refuges indirectly engineered by the elephants. Another study showed that small bird species, like the southern ground hornbill, can be positively influenced by elephants' destructive behavior via the creation of nesting sites. Yet another study suggested that vervet monkeys, which feed off the gum produced by certain tree species like acacia (important components of an elephants' diet), may benefit from elephants' bark stripping and branch breaking feeding behavior because of the plentiful helpings of gum produced by these processes. Elephants however are clearly unaware of their important role as an ecosystem engineer. Elephants provide small animals with accessible fruit (as well as most likely killing many an unsuspecting passerby in the process). Many fruits which bear a tough outer coating are impenetrable to many small animals; elephants help small animals gain access to these fruits by breaking through the tough outer coating in order to reach the fruit inside for their own consumption. The leftovers are then easily available to smaller animals. Having eaten nearly an entire coppice, elephants will then prove their worth as misunderstood horticulturalists by giving back to the now damaged or dead area in which they have partially destroyed; their excrement provides fertilization services to the ecosystem and in places in which elephants are provided with plentiful fruit, they play the role of seed disperser. Studies have shown that some plant species may depend entirely on elephants for seed dispersal, for example the upper canopy tree balanites wilsoniana is solely dependent upon forest elephants in Uganda to distribute its seeds. Elephants are recognized as mighty seed dispersers due to their capability of spreading seeds far from the parent tree, thus introducing the possibility of certain elephant dependent plants colonizing new areas.Research in the Congo has shown that forest elephants are capable of distributing seeds up to a distance of 57 kilometers from the tree which provided the fruit. Elephants are dedicated residents of any neighborhood they are part of and will go the extra mile to make amends of their weight-induced carnage in which they passively partake. Although we need to direct our conservation efforts towards saving animals that play a more important role in an ecosystem, it is clear that we must understand the role that every animal plays in its ecosystem, whether it takes up a mere few centimeters or a mighty ten meters. The loss of any of these can have disastrous effects. Rose Pohling is a research and development Intern at Frontier, an international non-profit volunteering NGO. Frontier has over 300 dedicated conservation and community development projects as well as plenty of inspiring gap year ideas to help make your time out meaningful. For more information on all the opportunities available please visit www.frontier.ac.uk. Check out Frontier's blog ‘Into the Wild' where you can read more articles like this! Happy reading! Get more from us on social media with Facebook, Twitter, and Pinterest. See more from volunteers on YouTube, Flickr and Instagram #FrontierVolunteer.